Golden Shamrock is a NetEnt presented online video slot game, which offers a jackpot of 4000 times of your total bet. This is a game of 5 reels and 40 paylines which has coins per line ranges from 1 to 10, while coin size for this slot ranges from 0.01 to 0.5 per spin. Return of the player percentage for the game is 96.4%, which seems good. 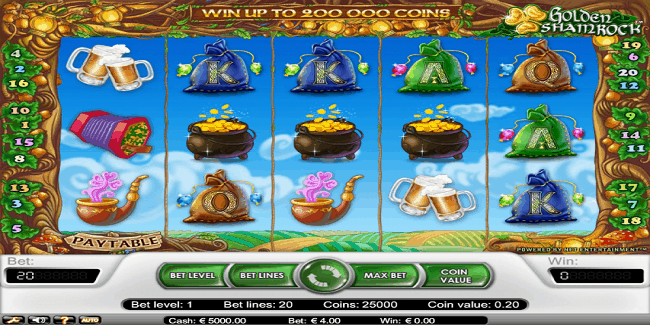 This slot is inspired by Irish legends of pots o’ gold and leprechauns. The background of the game is awesome, so is the graphics. You can play Golden Shamrock at any NetEnt online casino for either free or with the help of real money. This slot includes basic options such as “Coin Value” which is used to change the coin denomination, “Bet Level” to add multiple coins to each line and “Bet Lines” is used to adjust the number of active paylines from 1 to 10. 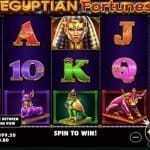 There is a circular arrow button available in this game which is used to spin the reels in motion for chosen setting and “Bet Max’ option is used to play the game with the highest bet level available with active line setting. You should only go for the spin option once you have fixed all the required option. 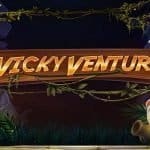 Golden Shamrock slot has life-changing win potential in it, hence playing it with real money at some of the best below sites could be great value for money indeed. If you land wild leprechauns on reels 2,3 or 4, it would be great and they would not be small winnings. They will expand to the whole reel and will definitely increase your winning. 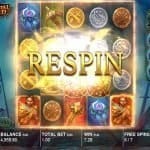 You can also trigger free spins while playing this particular slot game.